The wise ancient Egyptians had many ways to describe the human body, but the most revealing of them is contained in the phrase: Het ent Heh en Renput, which means "The Temple of hundreds of thousands of years." For they knew that the physical body is the temple in which the Mind attends the lectures of the material, in order to gain Experience Below to transmute into Service Above, so that with its Experience Above it shall Serve Below. Here, in a nutshell, is the grand scheme of evolution and the purpose of that body of ours which so many of us take for granted, and Science, notwithstanding the vast progress it has made in the last few centuries, still does not fully understand. This then, is the purpose of this investigation—to consider the body from many different aspects and hopefully learn something to our advantage, whether we are occultists, mystics, scientists or any other kind of seeker after Truth. Much of this article has been adapted from chapter 6 of Occult Enigmas by J Michaud PhD, the same book upon which our occult studies course is based. Some of this chapter formed the afterword to part six of this course on Intelligence when we told you something about 'The Temple you dwell in'. In this investigation we will extend and develop that short summary much further, and the only reason we did not do so before was lack of time, an omission we are now happy to correct. If you have not read our occult studies course, or at least parts four, five and six in which we discuss Reincarnation, Evolution and Intelligence, we suggest you do so if you wish to derive the greatest benefit from this investigation. In this way we are gradually building up a complete a picture of the great mysteries of Man, Life, Evolution and the Universe, insofar as this is possible. Indeed, we think it is fair to say that nothing like this has been attempted online before and that it is no exaggeration to say that no other website can give the seeker after Truth more real facts and accurate information about these subjects than we have done. If you have any experience at all of Occult teachings, or even if you have little or none at all and have only read a few of our articles, you will know that this is not an empty boast or a cheap form of advertisement on our part, but a simple statement of fact. In our customary afterword, we will look at what material science knows about evolution and the body and consider some of its discoveries and theories, both past and present. Before we can obtain full understanding of the spiritual part of man, it is necessary to know something about the dwelling-place of the Higher Self and the material conditions in which it finds itself. This is reasonable, is it not? Yet, we know of only one truly great Occult Order which does thoroughly investigate the body and the material world, most pass it by as of little or no consequence as we discussed with you in our article on why matter matters. If you have not read this, now is good time to do so. So the first thing we wish to say is that the wonderful temple in which the Higher Self resides—your body—is altogether taken too much for granted by many mystics, who either ignore it completely or attempt to beat it into submission by indulging in the various wrong-headed ascetical practises we have alluded to in several previous articles. And how can we have any clear perception of what the Higher Self is and the reasons it enters into incarnation if we are in ignorance of its earthly tabernacle? It is a commonplace thing to say, as many schools of occult or mystical thought do, that the mortal body is only a lump of clay, or is left behind, when we die, like a suit of worn-out and useless clothes. Indeed we have sometimes said much the same, but we have only done so to draw your attention to the higher things of the Spirit, not in denigration of the cloak that spirit wears, which is truly a very great marvel, as we shall see as we develop our theme. We have seen in our occult studies course that some of the ancient philosophers taught that the present earthly body, as we know it, first existed in the spirit. But no-one states how exactly it came to be materialised. When we consider that the skeleton of 'Ardi' (Ardipithecus ramidus), discovered in 1994 in Ethiopia, is supposed to have lived 4.4 million years ago, and that there is little difference between his skull and the heads of some men today, just how long had it taken for man to evolve, until he reached the stage of development represented by those ancient remains? And yet—even today—there are those who firmly believe that the world has only existed for 6,000 years! Must we classify them under the heading of numbskulls? We are tempted to come to this conclusion! There has been more nonsense written about the age of man and his evolution, and the age of the world, than it is possible to credit stupidity with. Perhaps, to a large extent, the many mistranslations of the Bible, giving rise to numerous misconceptions in this way, can be blamed. We must also remember that when the great library of Alexandria was destroyed, the greatest storehouse of ancient science was lost for ever. Most of the works of the ancient philosophers have also been lost, and what we have today consists of fragments of their writings only. The mind boggles at what may have been contained in those lost works! Nowadays we have Science, mystical conceptions, and a few shreds of the Ancient Wisdom, much of which is not available to the general reader, and what is accessible is largely dismissed and derided by scientists. In books on the occult we have descriptions of how the Divine Essence emanated from Adam and like a luminous arc proceeded to form a circle, and then, having attained the highest point of its circumference it bends back again and returns to earth, bringing a higher type of humanity in its vortex. We do not pretend to know exactly what this means. Inspirational writing of this kind has a meaning for the author which is generally hidden from all other understanding. This does not mean that we ridicule such a statement, but we could wish for a glimpse of the lost books in which it is said all this ancient wisdom was preserved. Then we have the ancient teaching that it is 'sin' that has made matter as dense as it is now and that at man's first formation, the human body was of a half-ethereal nature. Again we confess ourselves puzzled. Why half-ethereal? If man was first conceived in the spirit—which we do not doubt at all, since we are not here by mere accident, but by divine ordinance—why should not man in the first state have been entirely spiritual? It seems to us that this eternal 'sin' business has so hypnotised mystics of all times, that in the end it has become a barrier of such solidity that it shuts out all the light. In all legendary tales we read of a human race that was far above ordinary humanity, with unlimited wisdom. Plato—in Phaedrus—tells us of the race of winged men. Let us also remember that he described Atlantis. Does all this not point to an early race of man who had great wisdom and could fly—as we can fly today without the wisdom? We have pointed out in several articles that there is a basis of fact for all such legendary tales. The mythology of Mexico, Siberia, Central Europe, the Near East, and Scandinavia all describe a super-race, possessed of great knowledge and divine powers. The Ebers papyrus is considered to be one of the forty-two books of Hermes (Tahuti or Thoth) which the Egyptian priests showed to the Greek philosopher, Iamblichus, in 363 A.D. Of these books thirty-six were said to contain the history of all human knowledge, the last six books dealt with anatomy, pathology, medicines, and surgical instruments. This is borne out by the writings of Clement of Alexandria. Did Hermes or Thoth come from Atlantis? We would not like to say, though it seems possible that this name was the title for a class of Wise men, who introduced the arts and sciences of their vanished homeland into the lands whither they fled when Atlantis was destroyed. All this begs the question of where the Atlanteans obtained their wisdom, and how many thousands of years it took them to build it up. The Oriental Kabbalists claim to have traditions dating back to a hundred thousand years or more. Just how far back must we go in the history of man before we get anywhere near a beginning? Science has been searching for a "missing link," connecting man and monkey, for many years. Will they ever find it—even if we assume for a moment that there ever was such a being—or is the history of mankind so old that it is impossible for any early fragment to have survived? We know from Thomas Taylor's translation of Iamblichus' Life of Pythagoras that the Sage of Samos was initiated in all the Mysteries of Byblos and Tyre, in the sacred operations of the Syrians, in the Mysteries of the Phoenicians; that he spent 22 years in the adyta of the Egyptian temples, associated with the magicians in Babylon and was instructed by them in their venerable wisdom, and was skilled in Magic and Theurgy, so that he was able to perform things which surpass merely human power, and which appear incredible to the vulgar. Where do we find a man of such vast and unusual learning today? Yet, in the olden times of Egypt's greatness, there were many adepts of this type. How was all this knowledge obtained, and how long did it take to gather it all together if the claim of the Oriental Kabbalists is true? The mind simply cannot conceive such immense time periods. As we saw earlier, over four million years ago there existed a man, complete in every way, much as we are today. Four million years—according to Science—and why doubt it? How long did it take for man to be slowly built up, electron by electron, before he became as we are now and as that man was four million years ago? One would almost be inclined to accept Plato's statement: that there never was a time in which man did not exist on earth. Occult Science teaches us that progress is the law of life. Quite so—but before we can progress there must be a moment from which we begin to progress. But when did progress in the history of life on this earth reach man, or rather, when had Life progressed sufficiently in order to produce a being like a man? And when did he become conscious that he was a man? How long before he became a being like Homer, Goethe, Mozart or Rubens? In all this vast period of time, from 'Ardi' until now, there must have been many such great and inspired men. If brain-power was represented by the size of a brain, you would need a brain as large as the whole of London before you could with certainty get even a glimmering of an answer to the above questions. Yet it is not entirely impossible to have some idea as to how the Temple you dwell in came into being, provided always that the evolutionary scientists are correct in the picture they have painted for us of the plan of evolution, and of how evolution may have worked out, according to the evidences we see all around us in nature. Let us, with the scientists, the historians and philosophers, ponder a little on crocodiles and cabbages, buns and buffaloes, diamonds and dates, and other manifestations of God, and allow ourselves to become conscious of the truths in them, and so rise above the brutes, and draw large deductions and conclusions from our ponderings. 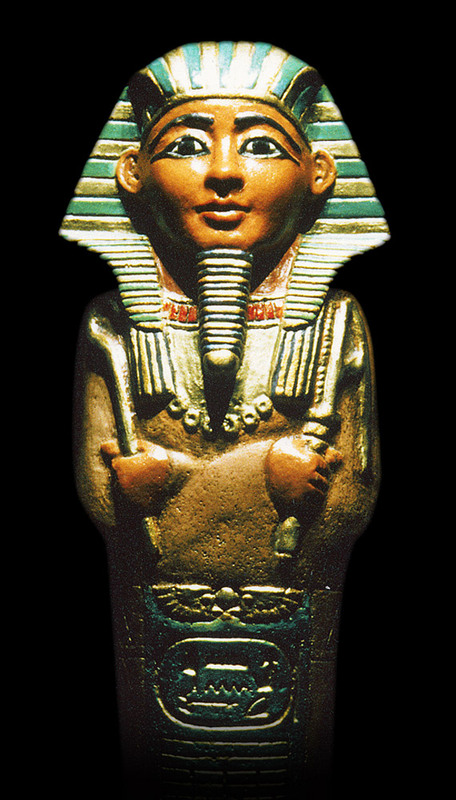 There can be no doubt that the ancient Egyptians had a great deal of veneration for the body. They knew it for what it is: the dwelling place of the Higher Self. They did everything they could to preserve life, and after life they preserved the body by means of a highly scientific process and a magical ritual. 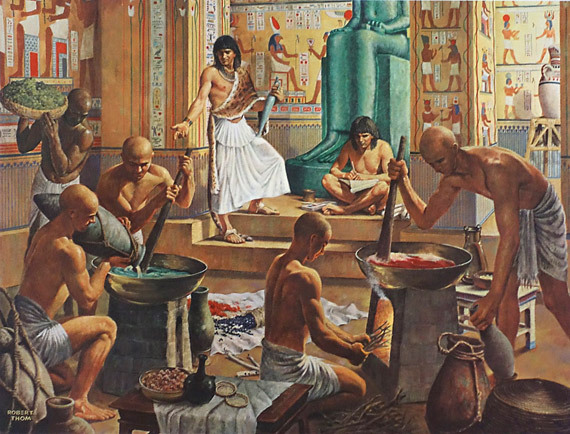 Their scientific methods in this direction have never been surpassed and it was not until recent years that modern Science began to penetrate the secret means of embalming in use in ancient Egypt. Some of the anatomical terms used are still unknown, and many of the pathological terms and names of diseases and the great majority of the drugs have not yet been accurately identified. There are many difficulties and obscurities on account of the Egyptian methods of expression, although the purport, if not the actual words of the papyri, are usually clear enough, and a prolonged study of the texts will enable the diligent student to form a fair, if not a full, idea of the nature and extent of the medical knowledge of the ancient Egyptians. 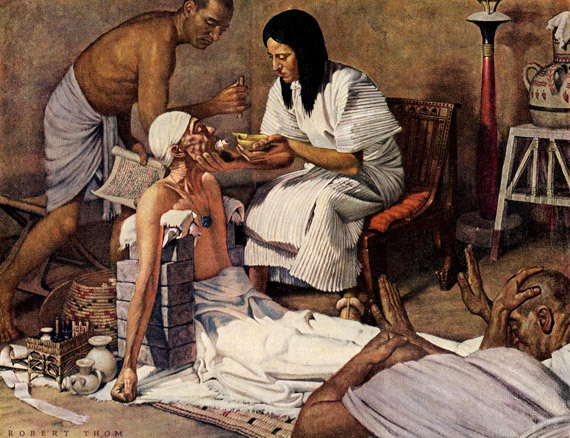 One modern Egyptologist has stated: "The result of my own studies have convinced me that most of the accounts of Egyptian medicine, published in the various medical histories, are unsatisfactory. They are for the most part based upon opinions expressed by Egyptologists many years ago, when our knowledge of the language was far less advanced than it is today, and before many of the documents now known had been discovered. Whilst we are still very far from being able to give a detailed account of Egyptian medicine, a careful study of the texts reveals the important part that Egypt has played in the development of Science: the Egyptian papyri are the earliest medical documents that have survived, and they must necessarily form the starting-point of all studies of the history of medicine." The ancient Egyptians, in common with other peoples of many tribes and nations, did not believe in death being the end of man's existence. In fact—in Egypt the words dead and death were avoided in every way. When a man had died they used to talk about him as 'he who is yonder,' 'the weary one,' and death itself was spoken of as 'putting into port, 'passing on', having been blessed,' whilst the King's name is always followed by the words, 'endowed, like Ra, living for ever, the good God; and when dead the great God.' The Egyptians believed not only in the breath of life but also in the breath of death. In the Book of the Dead (or the Dead Man's Book) we find that air was as essential for the dead as for the living, and the dead man uses spells in order to procure for himself the cool breezes of the North Wind. In the Ebers papyrus it is stated that the breath of life enters the body by the right ear and the breath of death by the left, and in the Berlin Medical Papyrus there is a prescription to "banish death from the ear." To avoid death Egyptians used to wear an amulet of red jasper or carnelian representing the blood of Isis and this amulet was also placed on the mummy in order to supply the blood that was lacking in the corpse. In the Pyramid Texts there are such statements as the following: "Have ye said that he is dead? He dieth not; thou hast not come forth dead, thou has come forth living; thou hast come forth that thou mightest live; thou hast come forth that thou mightest not die." This is spoken to the dead when they enter heaven or the higher regions. Everything possible was done in order to prolong life and to avert extinction; both here and yonder. That the Egyptians did believe in survival after death is proved by the fact of the provisions of food, utensils and a number of other objects, necessary to physical life, that were buried with the dead. The art and science of mummification was already well established as far back as the First Dynasty, about 4,000 B.C., and the earliest definite example is that of the body of a woman about 35 years of age in the Second Dynasty, discovered at Saqqara in 1911. The Egyptians greatly valued the sacred house of the soul and the practice of embalming lasted over a period of more than thirty centuries. It served a double purpose: preservation of the physical body from decay, and the perpetuation of the personal identity of the deceased. In the early times of Egypt incantations of all kinds were used as well as medicines. There has even been discovered a book for repelling fear, so there is nothing new in the modern ideas of 'mindfulness' and 'positive' thinking'! To a very few prescriptions were added the words: "he will be cursed if it please God," or, "he will recover by the power of God." We find similar prayers in the medical literature of the primitive Arabs, the Jews and many other peoples, showing just how old and persistent these ideas are. Now there is more in such incantations than mere superstition. The writer of this article knew a lady who could cure Shingles—also known as herpes zoster—simply by speaking certain words and phrases over her patients, an art she had learnt from her mother before her. This art is still practised today in Germany where it is known as 'Besprechen'—literally to 'bespeak'. Truly, as we say in our occult studies course, Magic is as old as Man! And there is no doubt that words, used in the right way by those who know their efficacy are magical in their operations, both for good or ill, a truth the ancient Egyptians clearly knew thousands of years ago. The ancient Egyptian physicians examined the body by placing hands on the various parts of it, such as the head, the occiput, the heart, the arms and legs on account of the pulse which can be felt in various parts of the body, which would show its sympathy with the heart itself. They also knew about the circulation of the blood as we discussed in our article on the Magic of Egypt. They regarded the heart as the most important organ. It was held to be the seat of all the emotions and its presence in the body was so essential to existence that it was not removed during the process of embalming; but was carefully left, attached to the great vessels, in its place in the thorax, although all the surrounding viscera were cut away. They knew of twenty different affections of the stomach, they had prescriptions for the lungs and liver, head and scalp, and fevers; also ointments for preventing the hair from falling out and turning grey. They dealt with affections of the mouth, teeth, tongue, throat and ears. There were a host of remedies for all sorts of rheumatic complaints and the diseases of women; also for ridding the house of all sorts of vermin. The Ebers Papyrus alone contains besides incantations about forty groups of different remedies that can be differentiated out of its total number of 877 sections. The Edwin Smith Papyrus provides us with a mass of new information regarding ancient Egyptian surgery, including the earliest written reference to brain surgery, an example of which we told you about in our article on the Magic of Egypt. One modern plastic surgeon who read a translation of the papyrus found that most of the cases described in it were about "really good reconstruction after traumatic injury, of the nose, the neck and the spinal cord," adding that "its techniques were surprisingly well thought-out and thoroughly up-to-date for such an ancient book." The papyrus even includes a recipe for 'Transforming an old man into a youth of twenty'! Despite considerable and exhaustive research, many of the ingredients referred to cannot be clearly identified, so if you were hoping that here at last was the long sought after 'elixir of youth', we are sorry to disappoint you! The papyrus cites many cases of appendicitis and pleural adhesions. Infantile paralysis was known and instances of dwarfs and other deformed persons. And so we could go on with cases of talipes (club foot, which the Pharaoh Tutankhamen was said to have suffered from), Pott's disease (a form of tuberculosis) spinal curvature, gout, cranial ulceration, mastoiditis, and even Dercum's disease, the latter being an extremely rare disorder characterised by multiple, painful growths consisting of fatty tissue occurring on the trunk, the upper arms and upper legs. The Egyptians used great numbers of different drugs in their prescriptions and hundreds of ingredients are mentioned from the animal, vegetable and mineral kingdoms, but, as we said earlier, it is very difficult to identify these remedies. The quantities are meticulously specified, minute fractional notation being employed, so that considerable care must have been used in dispensing them. Many of the remedies are still in use today, together with pills, poultices, bandages and so on. The papyrus even mentions a form of vaccination in which a small pellet of certain medicinal substances was inserted just below the skin of the upper arm, to be gradually absorbed into the body. To us, this seems a less invasive, and possibly more effective method of vaccination than injections direct into the bloodstream employed today—so much for 'progress'! Hundreds of extremely curious tests were made in order to ascertain the patient's condition and it would be possible to fill many pages with their recital. We have quoted the foregoing mainly in order to show that from the earliest times great store was set by the Egyptians on the preservation of the body, the cure of disease and the maintenance of health. The means employed were no stranger, and often much more scientific than some of the extraordinary things we read in such books as Culpepper's and Gerard's Herbals, not to mention the practises of bloodletting and the administration of mercury for syphilis and other diseases which were commonplace just two hundred years ago. At the beginning of the Christian era we find the works of the Greek physician Galen in the ascendant; the author of the most famous medical books of those times. As we proceed through history we find one after another man of Science making public his discoveries—or re-discoveries—of those secret principles which govern the Temple of Man, and today we behold the science of medicine at a point where it has risen far above the guesses and the quackery of the Middle Ages; the guesses now cover a wider field! But. . .they are still as far away from a complete understanding of this strange structure—the body—as ever. Indeed, we confidently predict that future generations will look back with no less a jaundiced eye—and considerable horror—at the present-day uses of chemotherapy and radiology, as we do at bloodletting. In our introduction we told you that one of the ways the Egyptians described the human body was by calling it 'The Temple of hundreds of thousands of years' (Het ent Heh en Renput). A more common and very much shorter name was Khat pronounced as in the English word 'cart'. This was written with the determinative of a stranded fish in the hieroglyphic language. This is not such a bad pictogram for that body of ours which is truly 'stranded' on the shore of earthly life without the Life Principle to animate it and the mind—both the Higher and the lower—to use it, whether wisely or unwisely! Fish also reminds us of a rather enigmatic statement in The Secret Doctrine: "And who perfects the last body? Fish, Sin and Soma." What on earth can this mean and how is it connected with our investigation? H. P. Blavatsky says anent this part of Stanza VII: "Fish, Sin and Moon' make conjointly the three symbols of the immortal Being," adding that "This is all that can be given. Nor does the writer pretend to know more of this strange symbol than may be inferred about it from exoteric religions; from the mystery perhaps, which underlies the Matsya (fish) Avatar of Vishnu, the Chaldean Oannes—the Man-Fish, recorded in the imperishable sign of the Zodiac, Pisces, and running throughout the two Testaments in the personages of Joshua 'Son of the Fish (Nun)' and Jesus; the allegorical 'Sin' or Fall of Spirit into matter, and the Moon—in so far as it relates to the 'Lunar' ancestors, the Pitris" (see Vol.1 p263). Let us see if we can shed any further light on this 'strange symbol'. The alchemist Eudoxus refers to it in an enigmatical manner in connection with the Philosopher's Stone in his Six Keys, in which he says: "This Stone has a bright glittering: it contains a Spirit of a sublime original; it is the Sea of the Wise, in which they angle for their mysterious Fish." This is the 'Man-Fish' Blavatsky mentions—a compound emblem for the Divine Soul and Higher Self—the immortal principles in man which 'swim' in the sea of the Aether of our Kosmos. 'Sin', as Blavatsky tells us, refers to the fall of the Higher Self into matter and its incarnation in a material body, whilst 'Soma' stands for the Hidden or Occult Wisdom which alone can liberate the Higher Self and effect its reunion with the Divine Soul, enriched with the experience it has gained during its many cycles of incarnations on earth. We would add that 'Soma' had and has other meanings too. It stands for a sacred drink, employed during the rites of the Mysteries; it stands for a plant from which this drink is made; and it stands for the Moon as Blavatsky tells us, for the 'Lunar Pitris' she refers to are the lower 'gods' who endowed our earliest ancestors with their ethereal, but still material bodies. Hence the words 'Soma' and 'Moon' are to some extent interchangeable. So in depicting the physical body of man as stranded fish, the wise Egyptians concealed a whole volume of meaning in one, simple symbol which is worthy of the deepest meditation. The ladies among our readers, and especially those who are mothers, will probably know that during its development from fertilized egg to parturition, the human embryo is virtually indistinguishable from that of a fish at four weeks. Indeed, it even looks like a fish! Remember too, as we discuss in our afterword, that the human body is composed mostly of water—and saltwater at that! Did the Egyptian Sages who chose a fish as the determinative sign for the word Khat know all this? We have no doubt of it. Truly, the Temple of Man is filled with manifold wonders and mysteries which it is the duty of Occult scientists to explore and explain in the light of their higher reason. But let us bring all our powers to bear on the problem, guided by the Wisdom of the Soul which knows all things—material and spiritual with exactitude—and not just our unaided intellect, as so many material scientists do. Such scientists—however knowledgeable in their own particular fields—must remain blind to the facets which lie outside and beyond their narrow specialisations. As we have learnt in this investigation, the Keys to the mysteries of the Temple of Man are many and no single science can possibly unlock their inner meanings, which remain the secret of the Creators, whether of worms or men. Yet this should not prevent us from availing ourselves—as thinking seekers—of the vast resources to be found in the material sciences of Biology, Physiology, Psychology, Chemistry, Archaeology, Physics and Astronomy. For all these sciences and many more we have not named, are needed if we wish to understand that body we take for granted, provided we know how to look, as well as where to look. The knowledge we acquire in this way is never lost. It will follow us from incarnation to incarnation, shedding light on the wonders of Creation that surround us on all sides and at all times. Such knowledge is the very essence of the Socratic injunction: 'Man—know thyself'. In the degree that we learn the material conditions and processes that have formed and preserve The Temple we dwell in, so shall we enlarge and deepen our understanding of the spiritual nature of Man too, by learning to contact the within of our selves, a microcosm so vast that it contains all creation, all wisdom, all the light you can possibly require. If we can enter the inner chamber of our great temple in that way, lit up by the lamp of God's spirit, then we shall find that there is no secret of the universe that is hidden from us: if we persist. If you can do all this your temple will light up with the holy light of God within, and its benevolent rays will stream out from the windows of your mind and bring joy and gladness into the minds of the weary ones of this illusory world of phantoms. It will teach you that there is no light in the shadows of the materially minded. Verily—we are the lamps of God. © Copyright occult-mysteries.org. Article published 9 February 2019. In this afterword, we review what material science knows about evolution and the body and consider some of its discoveries and theories, past and present. Science tells us that on average water makes up 60% of the mass of an adult human body, rising to 75% in infants. The brain and heart—two of the most vital organs in the body—are composed of 73% water, whilst the lungs are about 83% water. Even our very bones, which seem so solid, are 31% water. There is more to this than meets the eye, for as those of you who have read our article on the Magic of Water will recall, the earliest philosophers chose water to represent the primeval substance from which the universe and all that exists within it, first arose. And in the ancient Egyptian Pyramid Texts, which date from around 2,500 B.C., we may read how Khepera, the Creator, brought our Kosmos into being from the waters of Nu. In addition to water, the body contains 16% protein, 16% fat, 6% minerals of various kinds and 1% carbohydrate. Our bodies also contain 0.4% salt which, by a strange coincidence, is the same concentration that we find in seawater. If we now look at the elemental composition of the body we find that it is 65% Oxygen, 18% Carbon, 10% Hydrogen and 3% Nitrogen, with the remaining 4% accounted for by other elements. This is interesting, for in Vision 7 of The Golden Star (page 6), we may read that: "The four principal ingredients of physical nature are: Hydrogen, Nitrogen, Oxygen and Carbon." Now, as Science tells us, Carbon is the basis of all organic substances, so it is not surprising that after Oxygen, which we may regard as the 'breath of life' in more ways than one, Carbon is the most predominant element in the human body, as well as that of other animals and life forms. The Golden Star goes on to tell us: "Oxygen supports combustion, and is the active chemical agent of all organic life; Hydrogen burns in Oxygen and is the most stable of all compounds; it exists largely in all organisms; Nitrogen is an inert gas; it is the vehicle with which oxygen is mixed to adopt it for animal respiration; it enters largely in all organic substances. When these four principles are all together in any organic substance it needs only the addition of the vital spark, the living fire, to ignite the organism, and it can then develop and reproduce itself." Although it would be stretching a point to suggest that these four material elements are the actual four occult elements of Fire, Air, Water and Earth, there is clearly a correspondence between Fire and Hydrogen; Air and Oxygen; Water and Nitrogen; and Earth and Carbon. May it not also be possible that these familiar terrestrial elements exist in the higher dimensions in a more refined state? And if they do, the correspondence between them and the four Occult elements may be even closer the nearer they approach to the Source of All. This is more than mere guesswork on our part, for as many of you will know, the occult axiom, 'As Above——so below' always applies, material conditions being the reflection of spiritual causes according to the teachings of Occult Science. Having said all this, we should like to see any scientist take a couple of buckets of water, or even beer or whisky, a pinch of salt and a few chemicals, and construct a living body out of them! It just can't be done, despite the various claims of Science to have 'created' life in the laboratory. As early as 1932, Dr R. Beutner in his book Physical Chemistry of living Tissues stated that: "Life, therefore, in spite of all its complexity, seems to be no more than one of the innumerable properties of the compounds of carbon." Now this is where Science has always gone wrong, for none of the physical elements are capable of creating life, though they are needed to construct living forms. In 1972, two famous biologists, Gerard J. Tortora and Joseph F. Becker, diluted Beutner's statement to read: "The element carbon, perhaps more than any other, is characteristic of organic matter." This is certainly an improvement, but scientists still will not recognise that there is a higher principle that causes Life to manifest in the material. Science still thinks, after sneering for over 300 years at Paracelsus and his 'Homunculi' that it is possible to fabricate life in a test tube. It can't be done! This is not to say that material science has not made some remarkable discoveries during the last 100 years. The techniques for assembling three dimensional structures which led to the decoding of DNA (deoxyribonucleic acid) and RNA (ribonucleic acid) in 1953, are truly commendable achievements which we do not sneer at. In 1967 an American Scientist was awarded the Nobel Prize for 'creating' the entire DNA of a small virus. He then got this DNA to produce new viruses in the test tube. But what in effect he did was to set up a chemical printing press that could produce DNA copies from a master die. This master DNA was made by a virus, not man, but this has not prevented scientists from trying to make a master die. In the 1980s, researchers using recombinant DNA technology succeeded in manufacturing genetically engineered human insulin which has transformed the lives of millions. But these are still only material discoveries, despite the amazing possibilities these investigations of Science hold forth for the future wellbeing of mankind. In 2010, another American scientist, Craig Venter, reported that he had synthesized the sole chromosome of Mycoplasma mycoides—a bacterium with a relatively small genome—and transplanted it into a separate mycoplasma called M. capricolum, from which his team had previously extracted the DNA. This 'new' bacterium, nicknamed 'Synthia' is said to be capable of replicating billions of times. So it may be, but we say that this is still only a copy, not a 'new' life-form. This is all very praiseworthy, but it is not creation, only copying the work of the Creators. What Life actually is in the ultimate, where it comes from, and how it enters into living organisms, remains as much a mystery to the scientists as ever, but not to Occult scientists, as we discussed in our article on why matter matters. So much for the present theories of Science, what of its past speculations on the Temple of Man? In Haeckel's The Riddle of the Universe we read: "Comparative ontogeny, or the science of the development of the individual animal, is a child of the nineteenth century in even a truer sense than comparative anatomy and physiology. It is only seventy years since the embryologist Baer pointed out the correct means and methods for penetrating into the mysteries of embryonic life; it is only forty years since Darwin, by his reform of the theory of descent, gave us the key which should open the long-closed door, and lead us to a knowledge of embryonic agencies." All these older scientists believed that the complete body, with all its parts, was already contained in the ovum (the performation or evolution theory). Then there was the scatulation theory (boxing-up, or packing). This was evolved on the principle that as the outline of the entire organism, with all its parts, was present in the ovum, the ovary of the embryo had to be supposed to contain the ova of the following generation; and so on. On that basis the physiologist Haller calculated that God had created together, 6000 years ago—on the sixth day of his creational labours—the germs of 200,000,000,000 men, and ingeniously packed them all in the ovary of our venerable mother Eve! Even Leibnitz fully accepted this conclusion, and embodied it in his Monadist theory. In 1759 a young German Doctor disproved this theory, but it was not until after he was in his grave that Science would begin to accept his statement, which was called the epigenesis theory. Linnaeus, the famous Swedish scientist was the first to attempt a systematic arrangement of the nomenclature and classification of the innumerable objects in nature. To each kind of animals and plants he gave a specific name, and added to it the wider-reaching name of genus. This nomenclature proved of such great assistance that it was universally accepted and is still followed in zoological and botanical classification today. A host of scientists followed; each endeavouring to form a new theory in regard to the evolution of the species and the following theories may be mentioned as the most interesting in regard to creation and evolution. The dualistic creation in which God first created the inorganic world and then attained intelligence and communicated it to the forces which control organic evolution. The trialistic creation in which God created the heavens, the earth, and man, found in Genesis. The Heptameral creation of seven days, also found in Genesis. The Periodic creation, where at the beginning of each period of the earth's history all animals and plants were created anew and destroyed by a general catastrophe at its close. This comes closest to the Ancient teachings discussed in our article on Occult evolutionary cycles. And finally individual creation, where every man, plant, or animal is specially created by the favour of God. This theory still has its supporters among some Christian creationists! The merit of making the first important step in tracing the difficult path of creation and evolution, and of pointing out the way to a monistic solution of all the problems of biology, must be accorded to the French scientist Jean Lamarck. In 1809, the year of Darwin's birth, he published his famous Philosophy of Zoology, in which he makes a splendid effort to interpret all the phenomena of organic life from a monistic and physical point of view. This work led the way to the great enigma—the problem of the natural origin of organic species. Darwin, fifty years later, not only gave a solid foundation to all the essential parts of the theory of descent, but he filled up the gaps in Lamarck's work by his theory of Natural Selection. 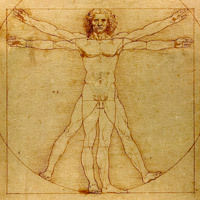 That the theory of the evolution of the species was not entirely a modern one is proved by the fact that Anaximander, who flourished about 570 B.C., said that the first man sprang from a different kind of animal, whilst Hippocrates thought that man sprang from a fish, which he at first resembled, and this is not so very wrong as we saw in our investigation. It was also stated by the early philosophers of that time that the first living things were generated in moisture, and were covered with a hard skin. When they were old enough they came up on the dry banks, and after a while the skin cracked off, and they lived on. Xenophanes taught that we all sprang from earth and water. Heraclitus, whose ideas we discussed in the first of our articles on Esoteric Philosophy, resolved into four words the eternal problem of the search for enlightenment, which will never cease and never come to an end by saying: "Nature loves to hide." This is still true today, for the further Science penetrates into the mysteries of Creation the more wonders she beholds. After the theory of the chromosomes was evolved, the next step was to discover the genes, and these are now considered to be the real units of heredity. Each chromosome contains a chain of genes. In some cases a single gene is sufficient to produce a certain marked effect, in other cases a group of genes conspire together, as it were, to produce another. Sometimes different genes counteract one another. But what is it that compels or urges the genes to act in these various ways? Here material science is silent. "Nature loves to hide!" Why the original prototype of man first varied from the rest of the animals is not known. Some scientists believe that mutations occur at random. Others believe that individual effort on the part of the animal can affect its germ-plasm. The 20th century French philosopher Henri Bergson called this the 'Élan vital' and this formed the basis of his celebrated vitalistic theory. But inevitably the same unanswerable question continues to confront us: "What was the origin of life on this planet?" There was the theory of spontaneous generation, but Pasteur proved this to be based on imperfect observation. Yet—scientists find it very difficult to accept a supernatural creative act, as it carries with it what are felt to be undesirable philosophic implications and is opposed to the scientific desire for continuity. The physicist and mathematician, Lord Kelvin (1824-1907) thought that the germs of life may have reached our planet from some other world. This theory goes under the name of Panspermia and was first mentioned in the writings of Anaxagoras in the fifth century B.C. In modern times Fred Hoyle (1915-2001) and Chandra Wickramasinghe were influential proponents of Panspermia. But this simply begs the question of how did these germs originate? The 19th century biologist Thomas Huxley said more than a 120 years ago: "Looking back through the prodigious vista of the past, I find no record of the commencement of life, and therefore I am devoid of any means of forming a definite conclusion as to the conditions of its appearance." Just so—and we are not one step nearer to the solution of this problem! As Science advances Nature retreats, as it were, into further fastnesses of the infinitely minute. The cyclotrons and other scientific instruments of today are thought to be the means to penetrate still further into the unknown, but the unknown will retreat as usual—"Nature loves to hide!" In the meantime, as we have seen in this investigation and in our article on gravitational waves, Science evolves one theory after another, only to reject each one after a shorter or longer lapse of time. The men of Science guess, and cover up their guesses with long and learned sounding words and phrases; each word or phrase another screen in front of the light of God, obscuring the truth and leading us into a deeper maze of still more guesses. If they take the liberty of guessing for their own province, why should the intelligent thinker be debarred from entering there? Why should the loudest shouters in physics, biology, biochemistry, geology, or whatever other 'ology', always impose their wills on the world and force the rest of mankind to unthinkingly accept their guesses as if they were Holy Writ? This has gone on for thousands of years; each school of speculators sneering at the other; all like overgrown schoolboys, trying to capture a ghost with a butterfly net, whilst the essences of life or diseases just sneer in their turn and escape through the holes! Can it be true perhaps that one or more of the thinkers of this world, people who do not shout, have solved the problem of first creation and subsequent evolution? In our occult studies course article on Evolution, we gave you our version of how it might have come to pass. This may be just as good a guess, or even a better guess than the guesses of Science. Who shall disprove it? You cannot dissect creation with a scalpel or boil it in a retort, and so find the final secret——"Nature loves to hide." For the secret of creation and the Temple you dwell in is a secret of the Spirit and it cannot be solved by material means. We cannot emphasise this important point often or strongly enough. Material science is one of the greatest achievements of the human intellect; but unless a scientist is also a truly spiritual man, he cannot have that inner discernment or vision which will light up his path with wisdom. It is inevitable that the strict training a scientist receives which allows him to reach his conclusions only by the observation of so-called scientific 'facts,' steeps his mind so deeply in materialism that the eye of inner enlightenment will fail to operate. Result—still more theories and guesses! And Nature still in hiding! By this we do not mean that we should employ psychics, who will (for a modest fee) 'channel' some discarnate entity with an impressive name and take down their portentous messages direct from the 'fifth' dimension, which messages will tell you anything from the movements of oil shares to winning lottery numbers, or how human beings are descended from extraterrestrial colonists. But we should seek within for the answers to the great mysteries of the without. For, as we said in the conclusion to this investigation, Verily—we are the lamps of God. There is a Light within each one of us which can shed light on all that is yet dark. And that Light is the reflection of our own Soul, which we call the Higher Self. What is the truth and real purpose of reincarnation? Material and Spiritual evolution compared and explored. Health and the occult student.